Discover your creative voice in SAW's Year-Long Comics Intensive. The Year-Long Comics Intensive is rooted in the longstanding tradition of mentorship and creative community in comics. 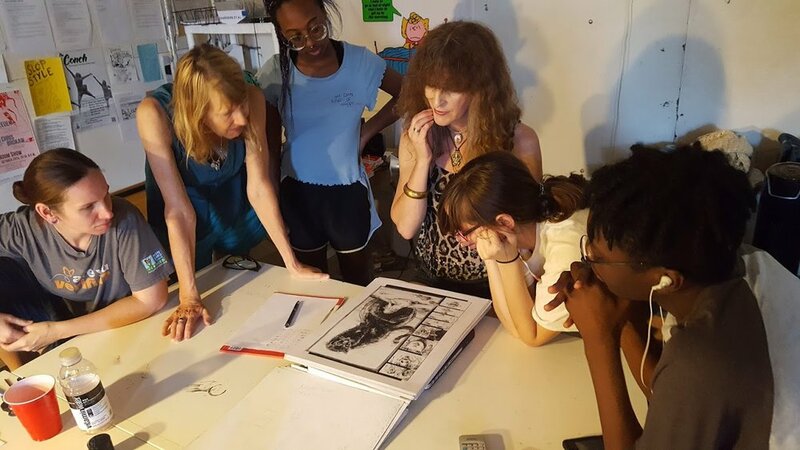 When you take a drawing class with Justine Mara Andersen, you’re tapping into a wealth of knowledge and insight Justine gleaned from her own mentors, including P. Craig Russell, Frank Thorne, and Jeffrey Catherine Jones. Tom Hart sharpened his skills in a vibrant, experimental, DIY community of indie cartoonists in Seattle, Austin, and New York City that included artists such as Matt Madden, Megan Kelso, James Sturm, Jason Lutes, and Leela Corman. By sharing, critiquing, and collaborating, these artist communities pushed the boundaries of comics storytelling. In alternating sessions led by Tom Hart, Intensive program at SAW aims to recreate this environment for peer-to-peer learning and risk-taking through group critique, shared studio space, and experimental work like improv comics and mask-making. The Intensive program also offers training in practical skills every professional cartoonist needs: you’ll learn how to pitch stories to editors, to navigate relationships with art directors, and to negotiate paid work. You’ll have the opportunity to travel to comic conventions across the country to sell comics, and to meet others in the community, including publishers. 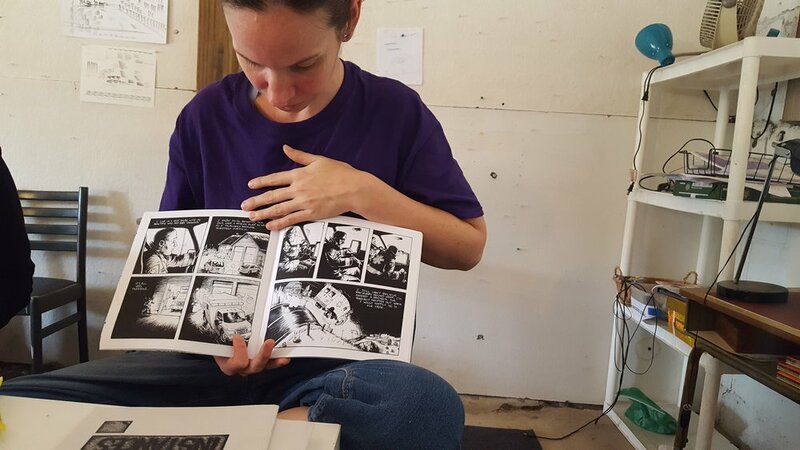 We designed this program to ensure that comics remains an accessible, community-centered medium, and to offer a personalized, affordable alternative to MFA and BFA sequential art programs. Exploration of sequential art through concentrated practice taught by Tom Hart. Students complete constraint-driven exercises as well as literary exercises of voice, point-of-view, shifting viewpoints, disruptive page layouts. Students self-publish at least twice by the end of this class. This class will deepen students’ knowledge of the language of comics while helping them find their artistic voice. Intensive, year-long study of drawing for storytelling. Justine Mara Andersen tackles inking and painting techniques, perspective, creative drawing with the panel. Students learn basic anatomy and perspective, then go beyond the basics to master expressive poses and evocative backgrounds. Beginning with comics pioneers like Töpffer and Hogarth to EC Comics and RAW Magazine, this class covers the history of comics. Students learn the context of comics in history, and in turn, the context of modern comics. 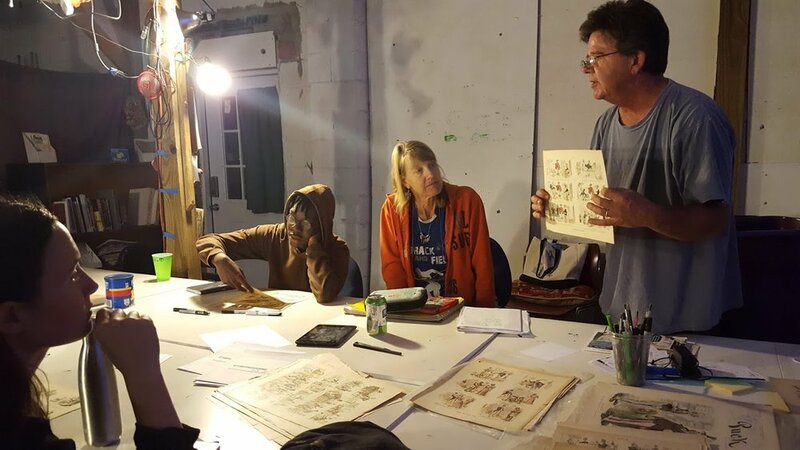 This class includes lectures from visiting cartoonists, printers and publishers, and guest teachers from different artistic backgrounds (theatre, sumi ink, animation). In alternating sessions led by Tom Hart, students read and discuss top-tier graphic novels. Plus, occasional figure-drawing sessions led by Leela Corman. Students are welcome to take week-long workshops and evening classes. You can see what classes are being offered next semester here. One (1) drawing from a photograph. Please write a 1-3 page personal essay about your history with sequential art, telling us your story. We understand that everyone has a different path to comics, and we want to know yours! The purpose of the essay is for us to understand where you are coming from—not to judge you, your writing abilities, or your taste in comics. Tell your own story in the best, most honest way you can: we're more interested in what you care about—your motivations and your goals—than in grasp of proper grammar. This essay helps us get to know you and where you're coming from, no matter whether you came to comics via Nancy or Naruto, the Dark Knight or Dirty Plotte. Don’t be nervous! We just want to get to know you, and for you to get to know us. This is also a great opportunity to ask us questions about SAW and Gainesville. The interview can be conducted by phone, in person, or video chat, depending on your preference. To apply by mail, click here to download the application form. While SAW is a not-for-profit organization, tuition is a very significant proportion of the school’s income. Your tuition keeps our instructors paid, our lights on, our copiers and risograph printers in good working order, and our supply closets stocked with everything from India ink to toilet paper. By offering sliding scale pricing, we are able to keep the program accessible to students from a wide variety of backgrounds and perspectives. We believe this makes our community learning environment more dynamic, richer and more challenging for all students. Please pay according to the scale above, taking into account your current annual income and your family’s income (if you are a counted as a dependent child, or supported by a partner or other family member) and any other resources you have (for example, if you receive money from a trust, or from a wealthy, mysterious elderly benefactor). SAW is proud to offer its first scholarships in the 2019 - 2020 school year. Women and people of color have always been making comics, but they are underrepresented in comics publishing. Starting with comics education, we want to help cartoonists of color and female-identifying cartoonists to break into comics. Apply by March 1st, 2019 to be eligible for the scholarships. More info here, or contact us for questions or more information. Drawing. Dreaming. Doing. Fun times at comics school. While you’re at SAW, you’re part of our community, which also includes helping us tend to the school, and its people. 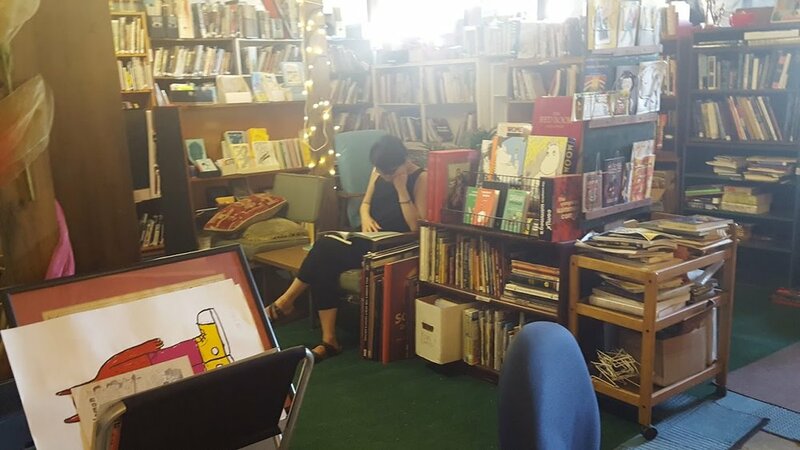 Students are expected to spend at least 1 hour/week volunteering at SAW (shelving books, cleaning the studio spaces, making posters). We like to say that SAW is a serious but informal school. What does that mean though? It means that we expect students to be serious about their work, be on-time to classes, and to finish assignments on time. Primarily, we are a community of artists, centered around helping each other find the best ways to tell our own individual stories. Gainesville is a place where creativity can blossom under the watch of Spanish Moss, waterfowls, and alligators. Gainesville is an arty, welcoming, DIY place that with loads of creative professionals, lots of ingenuity and creative excitement. It rewards initiative and offers lots of chances for engagement. Plus, it’s an affordable college town, where a bike is all you need to get around. Gainesville is a major university town and as such, very friendly to students. You should have no trouble finding suitable housing in Gainesville. Almost any house or apartment you find will be within biking distance of SAW which is a few blocks from the main intersection of University and Main. Prospective students will have access to the school Wiki/Facebook page where students can discuss and collaborate on finding housing. Note: The UF schedule means that houses and apartments rent from August to July. Look before then. The SAW FB Group can help each other find housing, etc. Excited? Want to know more about studying comics at SAW? Dive deep into a free multi-step series of videos and guides to help you explore all that the SAW YLCI has to offer!